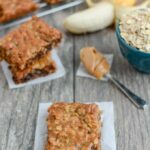 These Easy Banana Oat Bars are gluten-free, dairy-free, kid-friendly and make the perfect snack. Grab the kids and try this recipe today! One of my goals for 2017 is to encourage more of you to get into the kitchen with your kids. It’s messy, imperfect and can take forever…but it’s so worth it. You’re teaching them practical skills, helping them build confidence and encouraging creativity! Squish has been helping me in the kitchen for as long as I can remember. He’s only 2 years old but he can do quite a lot as far as helping with basic recipes. Do they look just like the ones I took pictures of for the blog post? No. Did I care? Not at all! 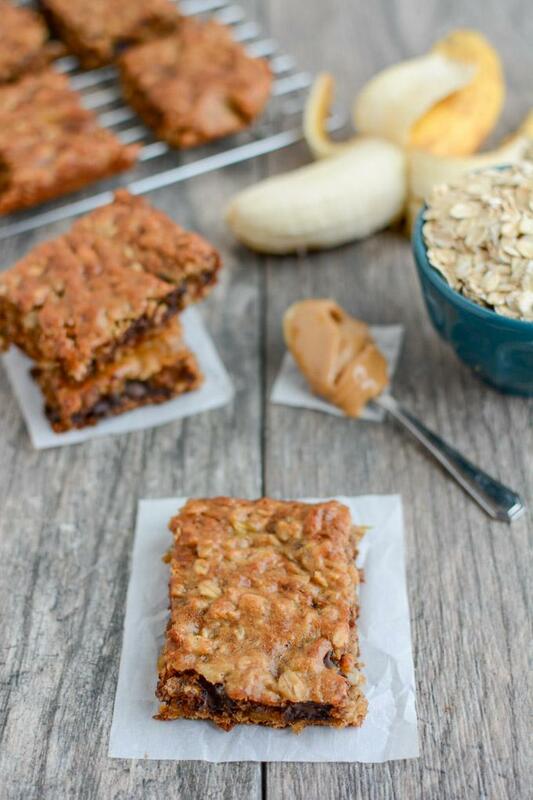 Yesterday we headed to the kitchen to make some banana oat bars. We actually make these fairly frequently because they’re pretty forgiving. They don’t require exact measurements and always taste good. Plus I always have ripe bananas on hand. This time I made a little video of my kitchen assistant to share with you guys. And then by a stroke of good luck, both kids were sleeping at the same time for a little while in the afternoon, so I took advantage and snapped a few photos so I could share them with you on the blog! My hope is these posts and videos will encourage you guys to grab your kiddos, head to the kitchen and make some beautifully messy memories! 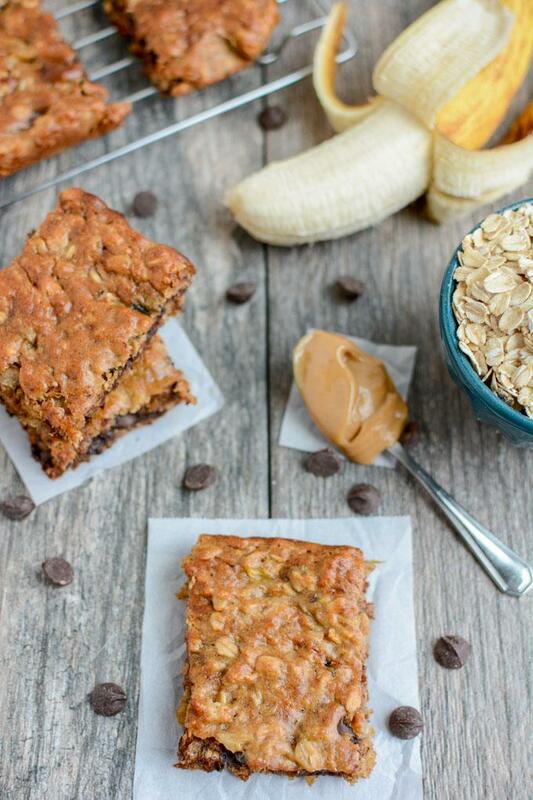 These Easy Banana Oat Bars are gluten-free, kid-friendly and make the perfect snack. Add oats, peanut butter, maple syrup and egg and mix well. Pour into a 9×9 (or 8×8) baking sheet lined with parchment paper. Super easy. Feel free to add a few more oats if your bananas are on the bigger side…mine were fairly small. Adjust the amount of maple syrup to your taste. If your bananas are super ripe, you could less. I used a 9×9 pan because that’s what I had. The bars aren’t super thick so and 8×8 pan might be better if you have one! Do your kids help you in the kitchen? What’s your favorite thing to make? I also think it’s a gift for me that I don’t define myself as a baker or a cook. About 50% of all we create is terrible and I can just laugh. Because really 🙂 I wouldn’t do any better on my own. My lil guy is coming up on 23 months and I haven’t had him in the kitchen yet. I really didn’t know where to start. But these bars look perfect, so I think we will give them a try later this week! Okay! I wish I could post a pic! My little guy and I went for a .5 mile walk to the grocery store to pick up the ingredients we needed. Then we came home and made these bars! It was messy but fun! These look like a great snack for kids! I totally agree– so important to get the kids in the kitchen with you. My boys–ages 8 & 10–prefer to help me with baking, but will hopefully get more into savory cooking soon too! These look delicious as-is but do you have a suggestion for a peanut butter replacement in order to make them daycare friendly? My toddler attends a nut-free daycare facility and I know that if we make these, he will want to take them for his morning snack. you could try sunflower seed butter! Love how easy these are and it’s such fun cooking with kids. My grandkids will love these. hope you guys enjoy making them! I have agave…will that work for a sweetener instead of maple syrup (trying to use what’s on hand). Your son is so cute, I can’t take it!! I follow you on snapchat too and I love seeing how he helps you in the kitchen!!! My son is just a little bit younger and I’m always like duh, he can do this with me too! It helps seeing your son do things in the kitchen because it reminds me to bring mine in with me too, instead of letting him watch Daniel Tiger while I prep! 🙂 I’m also working on getting him to try new foods and I think involving him more will help. I also need to be open minded- the other day he got upset when I was eating celery and didn’t share with him, it just never even occurred to me that he would want it! He ended up loving it. Also, while I’m here, I just want to let you know you’re doing such a good job at being a mom to two! I don’t have a 2nd baby yet, and can’t imagine how exhausted you must be right now. Yet you still keep going, and I’m always seeing new fun toys and activities in your snaps. It is really motivating to me! this might be the best comment i’ve ever gotten! thank you so much! My son is 2 years old as well and has never helped me in the kitchen. I always let him “pretend” cook while I’m cooking. I think I’m usually in a rush for actual meals and I like to bake while he’s napping so it’s ready when he wakes up. BUT watching your little guy help you has inspired me to try with my kiddo! He cant have peanut butter, but maybe I’ll try a different kind of nut-free butter because this recipe looks easy and delicious! Thanks! i’m so happy to hear that! hope you both enjoy it! they should work with sunflower seed butter! OMG he’s so cute…and he’s gotten so big! What an adorable family you have! Love the videos! I cannot wait till my little man is big enough to help! Thanks for the ideas to start them early. There are so many ways they can help. He LOVES helping you. How fun. yay! have so much fun when you start!! Yum – will have to try these! I saw this video on instagram and it was so cute!! Such an easy and simple recipe! I added 2 tablespoons of coconut flour and 2 tablespoons of organic ground flaxseed to up the fiber content. Delicious! awesome! good to know, thanks! My daughter is only 16 months but was more than happy to stand on her stool and help me make these. Iv been struggling to get her to eat fruit so started experimenting with some easy recipes. She loved mixing (prodding) and she even ate most of 1! 1-0 to mummy!! I think I will need to half the recipe next time otherwise I will eat them all. I don’t suppose you know how long these will keep? they should be fine for 4 days or so! Will they keep longer if you put them in the fridge? What are the nutrition values for these? These look amazing!! Could I use honey as a substitute?? We just made these and they are so yummy! We did make a few adjustments. We added in 2 tbsp of ground flaxseed, did 1/4 cup of dark chocolate chips and 1/4 cup chopped walnuts, used almond butter (as one of my kiddos dislikes peanut butter) and our bananas were quite large, so we used two of them. Thank you for the great recipe! Just curious how you know when they are done. I left mine in for the full 20 + another 10 minutes because they looked gooey and they are still gooey/underdone. my guess is your “small” bananas were bigger than mine. I’m going to retest the recipe and update it to include a more concrete measurement for the bananas (ie 3/4 cup) or whatever to help make it a more consistent recipe. Would there be an appropriate egg replacement for these? you could try with flax eggs! These are my absolute favorite to make with the kids. I just usually let them make them, the mess and their smiles are equally as big. I just leave it 350 for 15 minuets. Hello there! Do u think these are freezer friendly? definitely worth a shot! i haven’t tried it myself! How long can I keep these for? Can I put these in the freezer? Do you leave them out or in the fridge? i usually keep them in the fridge! Great recipe! Easy, healthy & teenager-approved. Will probably double next time if I have enough ripe bananas. Might even buy extra bananas in anticipation. Used honey instead of syrup (about 2 Tbsp. ), which worked fine. I made this… and when it came out of the oven and I tried it, I made another batch right away!! Lol! this recipe is spot on! The flavors are perfectly combined to excellence! I’m 32 weeks pregnant with my second child, and I know this is going to be made often in my home from now on. They say that Intaking oats are a great way to promote healthy milk production during lactation. So this is perfect. Also I will be using these for a post workout snack. The banana, oats and peanut butter are the perfect replenish combo! Thanks so much!! TRying it with shredded coconut instead of chocolate chips! It’s in the oven now. Looks good!